December 3, 2018 Robert W.
Trade show stand up banners are used extensively at the trade shows. These popular display graphics are cheap and effective for advertisement of your products and services and are a very large graphic that allows for a lot of pictures and graphics to be printed on them. For example, the popular 33″ x 78″ economy stand up banner has almost 17 square feet of printable material on it. That’s greater than a four foot by four foot sign ! What’s more is that these trade show stand up banners are easy to set up, compact ( they come in a carrying case)and are a stand alone graphic, which means they can be placed anywhere independent of other graphics. Trade show stand up banners come in many different sizes to meet your graphic needs. These stands come in the 33″ wide model all the way up to 57″ wide and in economy and premium models. They all come with a carrying case so that they can be moved around easy and all come with an adjustable pole that allows for height adjustment. For example, if you have a 33″ x 78″ stand up banner but did not wanted it to be only 65″ tall, the adjustable banner stand pole allows you to make it that size. Inferior banner stand models with the tent pole system, allows for no adjustment and you have to make the banner have a bleed or dead space because there are no ways to adjust the stand. Also, these trade show stand up banners are full color prints that can include printing logos and pictures on the graphics as well. Trade show stand up banners can be designed and made right here in Las Vegas Nevada and be shipped to your hotel for delivery very fast. 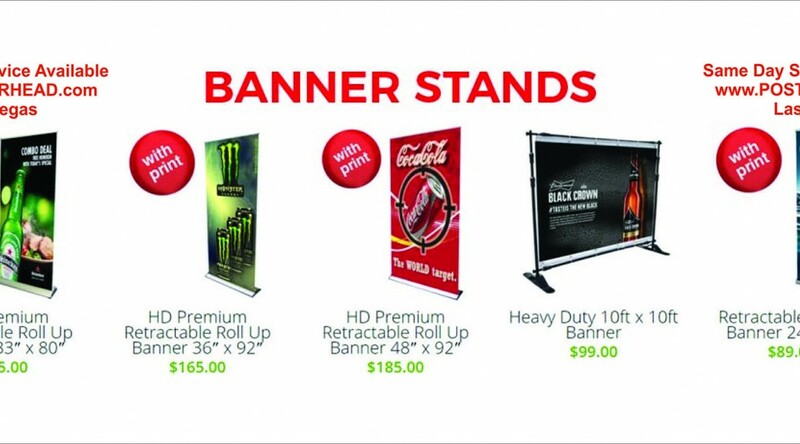 Same day trade show stand up banners are also available at many signs stores in Las Vegas.